Orleans Parish, La.- The Louisiana Department of Transportation and Development announces that beginning on Feb. 7 there will be a temporary three-month closure for the median opening at the intersection of U.S. 90 (Gentilly Boulevard) and Caton Street in New Orleans. The Department has identified this area as having a high potential for safety improvements due to the large number of crashes reported at this intersection. The temporary median closure will be constructed using traffic barricades and water-filled barriers. During this three-month period, DOTD will monitor changes to traffic operations, as well as review feedback from the community. After it has been determined that no significant safety or mobility concerns arise from the temporary closure, DOTD will seek funding to permanently close off the median opening by installing a permanent raised median. 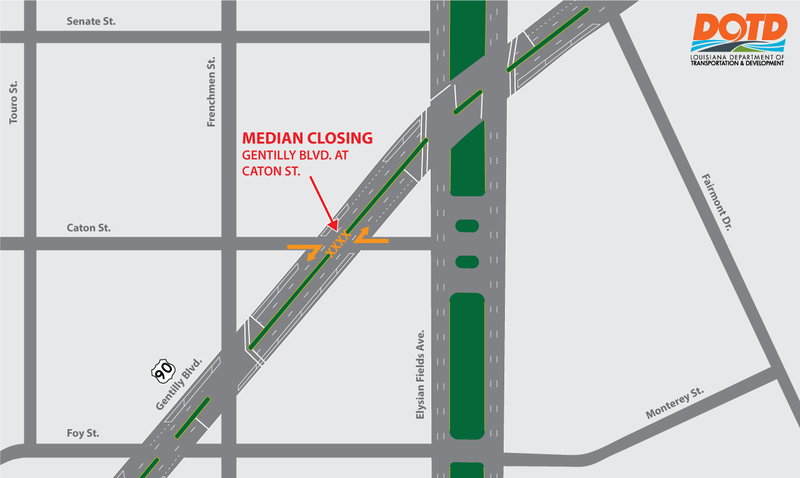 This closure will cause minimal impact for motorists traveling through this corridor and will require motorists entering Gentilly Boulevard from both directions of Caton Street to turn right. In order to accomplish this work, a lane closure is scheduled for the left lane on Gentilly Blvd. on Feb. 7 from 9 a.m. to noon. All construction activity is weather dependent and may be rescheduled in the event of inclement weather. DOTD appreciates the motoring public’s patience and reminds drivers to please exercise caution when traveling through work zone areas and be on the lookout for work crews and their equipment.